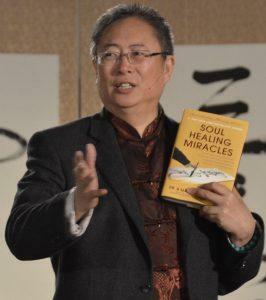 The healing power of your soul is brought to you by dr and master Zhi Gang Sha. Dr and master Sha is an ascended master. His teachings have reached millions all over the world. And the power of his words and deads have become legendary. Author of many books, translated in many languages. He was both educated in the eastern and western traditions of medecine. He also was the lead acupuncturist for the World Health Organization. Grandmaster of many ancient disciplines, including tai chi, qi gong, kung fu, the I Ching and feng shui, he is also an expert in contemporary healing sciences. He is the founder of the Institute of Soul Healing and Enlightenment and the World Soul Healing, Peace and Enlightenment Movement… amongst many. He is on facebook, youtube, twitter (@ZhiGangSha) and has his website.